A few weeks back I came across this blog by Vir Sanghvi called Oh! Calcutta. It seemed a very popular article, an obvious inference given the number of views the page had. I do not quite recall how many times I went through the article in the next half an hour that followed. I also do not recall how many times I felt a big lump in my throat. But by the time I was done, I could actually remember almost every little detail that he had mentioned about THE city. And also that I got goose bumps every-single-time. Okay, perhaps it was not the best of time to read a post about Calcutta- 1) because the Durga Puja was just a couple of days away, 1) because it was the first one I was spending away from home, 1) because it was getting worse with each passing day with the exponentially increasing Puja posts on Facebook (I know numbering, it's just that all were priority one). Later, I wondered if the article would have exuded the same emotions had I read it in Calcutta. Perhaps not. I mean when I used to live there, I used to get annoyed by the traffic, the noise, the pollution, the fact that garbage was everywhere on the road, the humidity and so on. But now, I crave for these very things (definitely not all, but most of them). I remember when I first came to Jena, a friend had asked what I miss the most about Calcutta and I had said 'the chaos'. Earlier, traveling with the bus or the metro would be painfully annoying and I remember how I would curse under my breath every few seconds. But this time when I went back, the first thing I wanted to do was take the over-crowded metro and go to Esplanade. And auto-ride to Gariahat! Earlier Jadavpur was one of the places I wanted to avoid, because of the terrible traffic system. But this time I took loads of pictures of Jadavpur and brought them back with me. And I payed particular attention to the fact that the pictures should capture the true essence of Jadavpur- with the autorickshaws and the buses and the taxis blocking the road, people crossing the road from every side, hawkers almost in the middle of the road and so on. I remember how I was constantly complaining about the bureaucracy while applying for the transcripts at the University, how much I was pissed because of the slackness and complete unprofessionalism of people, how much the lack of sanitation and poverty bothered me. Ofcourse they still bother me. But when I think of the city now, somehow I just look past these things. Recently I read a Calvin and Hobbes comic post about Calvin wondering if his mother would still have the nerve to love him if he was 'gray and grimy, slippery and slimy, an oversized hors d'oeuvre'. 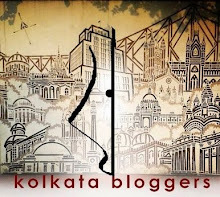 Apart from the fact that I absolutely love it, it quite echoes my feelings for Calcutta.